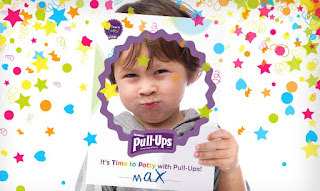 As your child makes potty progress, reward him with a congratulatory certificate of achievement. A big part of making the steps toward the big finish, and giving them the encouragement they need is positive reinforcement. This will help make those steps a little easier along the way! • Next Level Sticker Chart -- Show off your child's potty successes by creating a sticker chart with your little one. Allow your child to pick a small sticker to put on the chart every time she is successful on the potty! • Build a Bathroom Puzzle -- Help your child solve this Build-a-Bathroom labeling game because to them the bathroom might seem like a mysterious place. • Potty Time Sequence Card -- Help keep track of potty time by creating these fun sequence cards detailing each step of the potty training process. • Potty Training Race -- The Potty Training Race game is a fun and easy way to teach your child how to use the potty, as well as give him a cue word for when he really needs to go!